The motto "Safety First" guides everything we do, every day. Safety is smart business. Taking care of our customers begins with taking care of the teammates who get the job done. Since 2005, we have partnered with the Occupational Safety and Health Administration (OSHA) through its Voluntary Protection Program (VPP), which recognizes companies that voluntarily exceed the safety standards required by law. Achieving VPP status requires a rigorous safety and health management system. 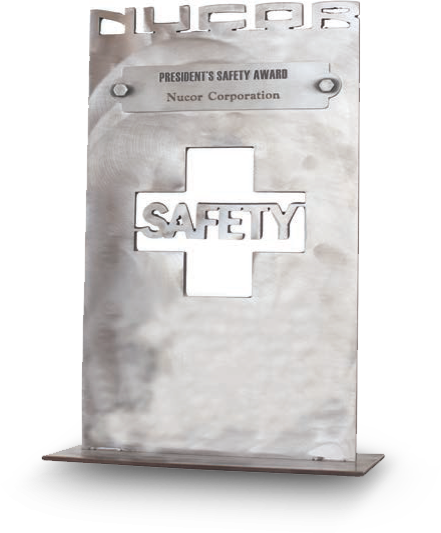 Since 1998, the President’s Safety Award has been awarded to Nucor divisions that record Injury and Illness and DART (Days Away, Restricted or Transferred) rates 2/3 below the national average for comparable facilities. High-performing divisions that are VPP-certified are given CEO Recognition. Nucor offers its teammates a range of health services and benefits designed to help them thrive at work and at home. Nucor health fairs emphasize prevention and have succeeded in providing teammates with life-saving health insights. Several Nucor facilities provide ongoing health and wellness opportunities, including medical staff and equipment, and on-site fitness centers. The NuYou health and wellness program helps Nucor teammates make better healthcare decisions. We have seen consistent decline in the percentage of “at risk” teammates in every category we track.